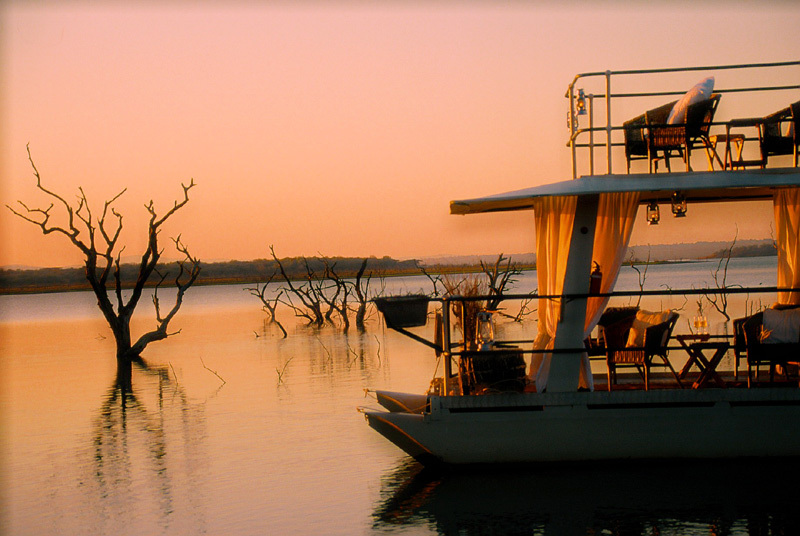 The Boating and Bundu-Bashing Safari: What a Great Combo! In Pongola, Lake Jozini shines like a just-polished mirror in the beautifully rugged bushveld. 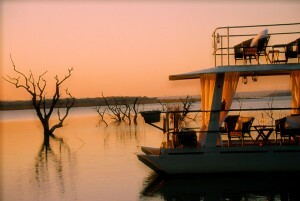 Set a good few days aside to stay at White Elephant Safari Lodge and sharpen your teeth for a magnificent wildlife safari plus some really memorable boat trips on Lake Jozini. The call of the fish eagle cutting through the quiet of morning is likely to linger in memory for a while, beside prized visual snapshots of pods of hippos snorting in a setting that must be pretty close to perfection. Add sunset into the mix later on, and you have another truly spectacular cruise. At White Elephant you can also cast for tigerfish with the lodge’s expert fishing guide. See if you can beat the 1997 record of the Big One that weighed in at 8.9 kg! 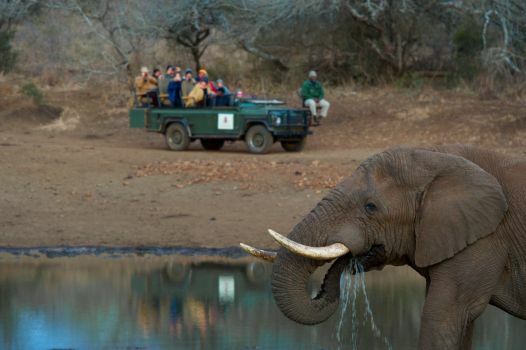 Bush activities include exciting rhino walks (with lots of info about the endangered black rhino) and elephanting safaris – these go way beyond ellie sightings and include the monitoring of ellies in which White Elephant has been a pioneer in this area. Your guide will offer you a real sense of the challenges facing these amazing beasts. Lots of other species can also be viewed, including crocs. Another wonderful boating & bundu-bashing safari is at Hluhluwe River Lodge. Explore the bush with a guide in the Hluhluwe iMfolozi Park. The Hluhluwe section of the park comprises about 40 000 hectares and one its claims to fame is that it supports one of the highest concentrations of rhino in Africa. Have your fill of the bush, but also enjoy the area’s vast floodplain. 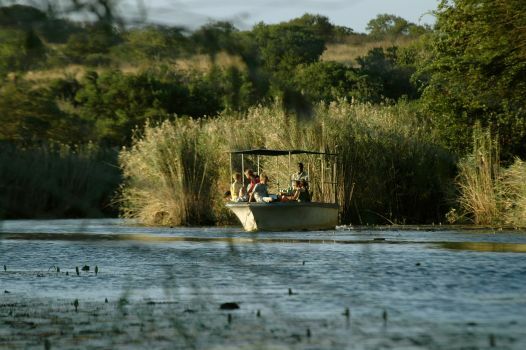 Hluhluwe River Lodge is set very close to the Hluhluwe River and its extensive floodplain and reed beds. River cruises are fantastically serene and deliver wonderful sightings for birders. You can also do a mountain bike ride to False Bay Park – a 2300 hectare reserve along the western shoreline of Lake St Lucia and part of the iSimangaliso Wetland Park, or you can take to a bush trail on horseback. A gorgeously luxurious surf-and-turf experience awaits you at Thanda Private Game Reserve. Choose an exclusive bush hideout in the form of a suite, a tent or a villa, and allow yourself to be entranced by the bushveld. There are bush drives and walks every day, and these typically reveal all the wildlife one hopes to see in Africa. The Big Five roam the area, in the good company of many others, such as wild dog, endangered black rhino, cheetah, hyena, warthog, and lots of plains game and birds. Head for the water and take a hippo and croc tour. You’ll spend about two hours on a boat (with bar facilities) exploring the St Lucia Estuary in pursuit of hippos, crocs, fish eagles, herons, kingfishers and mudskippers. A host of other activities are available and these include deep sea fishing trips, and a boat trip to view turtles, sharks, dolphins, pelagic sea birds, flying fish and more. There’s also a gemstone and geology trail that takes you along a winding path into the Lebombo mountains in search of gemstones and crystals.